Postoperative fluid collection due to pancreatic leak is the most frequent complication after pancreatic surgery. These collections often extend into the peritoneal cavity between visceral organs and have an irregular shape, thus increasing the difficulty of drainage. The frequency of fluid collection after pancreatic surgery is not well established, but it seems to occur in 4% to 40% of cases.,,,, The pancreatic duct leak rate has been reported to be 5% to 20% for the Whipple procedure,, 5% to 60% for distal pancreatectomy, and 5% to 40% for central pancreatectomy. Frequency is extremely variable depending on series and the definition used. In 2014, the International Study Group of Pancreatic Study published a better definition of pancreatic fistula, which helped establish a more reliable frequency of post-surgical pancreatic fistula. This frequency is as follows: between 22% and 26% for the Whipple procedure; 30% for distal pancreatectomy; and between 20% and 60% for central pancreatectomy, which was the highest reported rate and was likely due to the creation of two pancreatic remnants and thus two potential sites of fistula. Nearly 40% of these collections require additional treatment., Some authors claimed that post-pancreatectomy duct leaks can be managed through conservative treatment. Pancreatic fistula is classified into three grades: Grade A, spontaneous resolution; Grade B, management with a drain in situ, and Grade C, additional intervention requirement. For a Grade C symptomatic fistula, some researchers have proposed endoscopic drainage. However, these studies reported varying etiologies of postoperative fluid collection, pseudocysts, and several methods of drainage.,,,, Regardless, endoscopic drainage was preferred over percutaneous drainage because percutaneous drainage led to a lower quality of life due to the external drain, and the risk of permanent pancreaticocutaneous fistula in 25% of cases., Studies investigating endoscopic treatment of post-pancreatectomy fluid collection have focused on transpapillary drainage; however, this technique has limited efficacy due to the limitation of the size of the pancreatic stent used. Therefore, EUS-guided drainage for post-pancreatitis fluid collection has also been extensively evaluated., The same technique was used to drain post-partial pancreatectomy fluid collection with no differences in technical success and procedure-related complication compared to pseudocyst drainage, as reported by Cavallini et al. EUS-guided drainage has replaced the transpapillary route in recent publications; however, these previous studies included a small sample of patients and short follow-up period.,,,, Although the technique itself is described well, the drainage timing, efficiency, and long-term recurrence is not well evaluated. In this retrospective study, we examined post-pancreatic surgery fluid collection managed with EUS-guided drainage over long-term follow-up. The primary endpoint was fluid collection relapse over long-term follow-up. The secondary endpoints of the study were clinical and technical efficiency and the rate of morbidity. This retrospective study was conducted at a single center from December 2008 to April 2016. 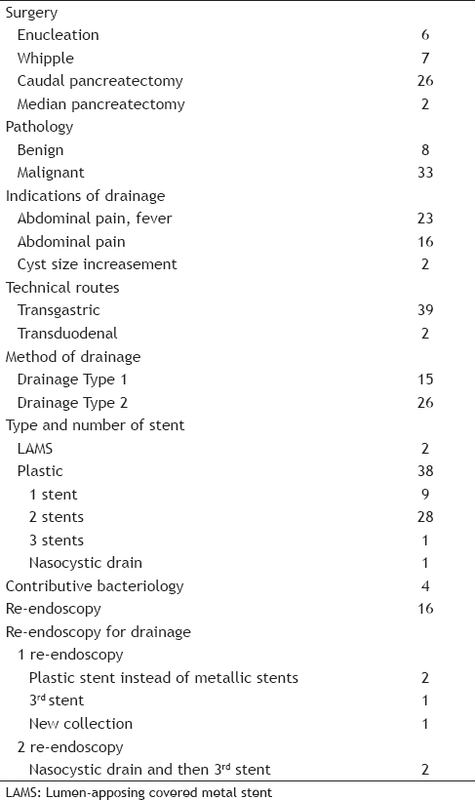 EUS-guided drainage data were collected using a medical endoscopic coding database. Data on EUS-guided drainage of pancreatic fluid collection were extracted from this database. A retrospective analysis was performed in July 2016 using the hospital's prospectively collected computerized patient file. In the absence of recent data, patients' physicians or referring gastroenterologists or the patients themselves were contacted. Patients who underwent partial pancreatectomy with EUS-guided drainage of postoperative fluid collection were included. All patients underwent computed tomography (CT) before drainage. Drainage indications were a welldefined fluid collection on the CT scan and symptoms. Symptoms included pain, dysphagia, vomiting, or signs of sepsis. Collection size was defined on the CT scan. Post-EUS morbidity was defined as the occurrence of an event involving re-endoscopy, rehospitalization, or interventional radiologic or surgical procedure (disease relapse excluded) after EUSguided drainage. An EUS-related adverse event was defined as intracystic hemorrhage, bleeding on the puncture route, and sepsis involving re-endoscopy. 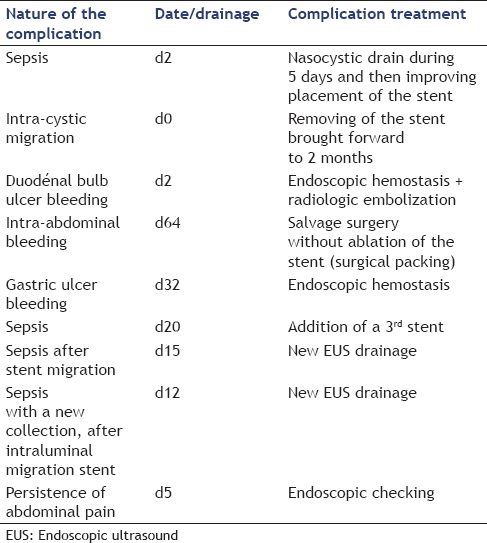 Post-EUS procedure morbidity and EUS-related adverse event also included stent migrations within the collection. Intraluminal stent migrations were considered a complication only if another endoscopy was needed. EUS-related adverse events excluded bleeding due to arterial injuries, such as gastroduodenal artery or splenic artery injury, gastroduodenal ulcers, and re-hospitalization for transfusion without obvious etiology. Technical success was defined as successful stent placement. Drainage was considered a clinical failure if another surgery was needed after the endoscopic procedure (disease relapse excluded) with removal of the stent during the additional surgery. In all patients, the plastic stent was removed at 3 months post-drainage after CT scan control. The follow-up period began at the date of drainage and ended at either the date of the last follow-up or the date of surgery for disease relapse or death. The EUS-guided procedure was performed under general anesthesia with the patient in a supine position. All procedures were performed using therapeutic linear array echoendoscopes (EG38UTK; Pentax, Tokyo, Japan) with large working channels of 3.8 mm, and under triple guidance with ultrasound, endoscopic, and fluoroscopic control. A puncture site was selected based on a minimal distance between the EUS transducer and the collection without interposed vessels, according to color Doppler assessment. After insertion of the 10 Fr cystotome, a transmural lumen-apposing covered metal stent (LAMS) could be placed without dilation of the tract (Nagi 10 mm × 30 mm; Taewoong Medical Co. Ltd., Seoul, South Korea). In this case, a 7 Fr double pigtail stent was inserted through the LAMS to prevent migration. Descriptive statistics were used to describe the categorical (counts and frequencies) and continuous (median, range, and mean) variables. The complication rate was estimated with its bilateral Wilson's confidence interval. The area under the receiver operating characteristic (ROC) curve was estimated for the complication outcome depending on the time from surgery to drainage, along with its bilateral Wald's confidence interval. The best cutoff point was evaluated corresponding to the minimal distance to the point of maximal sensitivity and specificity. The odds ratio (OR) of the complication outcome associated with the time from surgery to drainage was estimated along with its bilateral Wald's confidence interval. The follow-up of patients with and without complication, respectively, was estimated using the inverse Kaplan–Meier method and was compared using a log-rank test. All statistical analyses were conducted using SAS® software version 9.3 (SAS Institute Inc., Cary, NC, USA) at a significance level of α = 0.05. From December 2008 to April 2016, 41 patients (19 males, 22 females; mean age = 61 years; standard deviation = 12.8 years) underwent EUSguided drainage for post-partial pancreatectomy fluid collection (mean size = 76 mm). These data were collected for 223 procedures performed for EUS-guided intra-abdominal fluid collection, which were complications of 681 partial pancreatectomies from a total of 694 pancreatic surgeries. Surgeries included Whipple resection for 7 patients, median pancreatectomy for 2, left pancreatectomy for 26, and enucleation for 6. With regard to histology, 12 patients had pancreatic adenocarcinoma, 9 had endocrine tumors, 8 had an intraductal papillary mucinous neoplasm without carcinoma, 3 had liposarcoma, 3 had mucinous cysts, 2 had serous cysts, 1 had a pseudocyst, 1 had duodenal adenocarcinoma, 1 had a metastatic lesion from an ovarian tumor, and 1 had a stromal tumor. The technical success rate was 100%. Three patients needed postEUS-guided salvage drainage with ablation of the stents; therefore, these were considered drainage failures. EUS-guided drainage was considered a clinical success in 93% (38/41) of the cases. Most of the drainages (95%) were performed with plastic stents and most with at least two stents (76%). 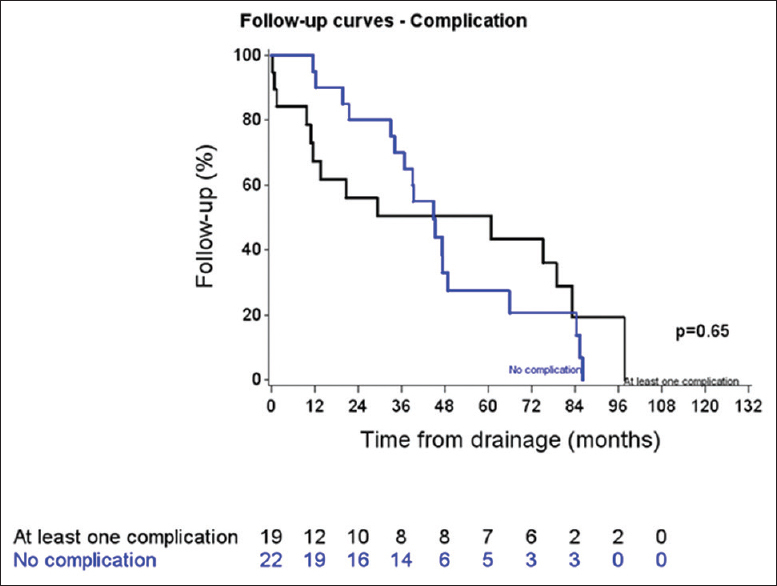 No pancreatic intraductal stents were placed [Table 1]. Mortality was not reported in the study. 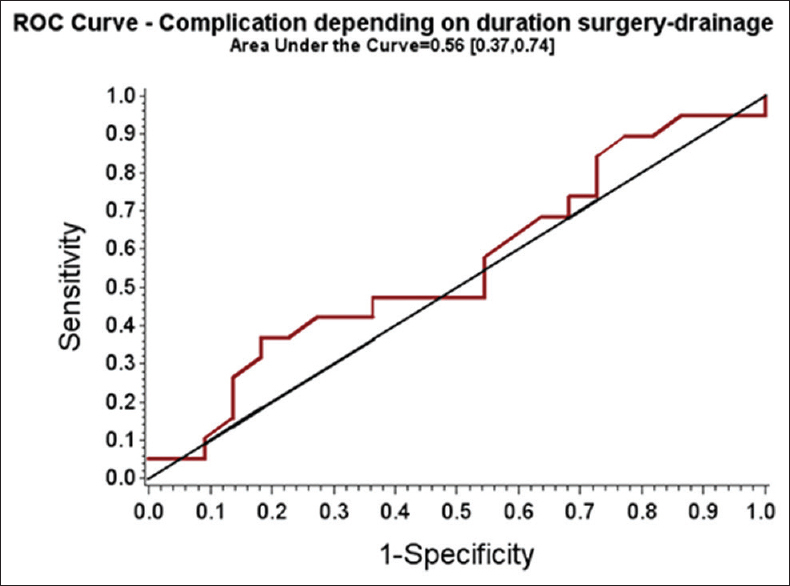 The area under the ROC curve for the complication outcome depending on the time from surgery to drainage was quite low (0.56 [0.37–0.74]). There was no significant effect of the duration from the initial surgery to EUS-guided drainage on morbidity rate (OR = 0.99 [0.98; 1.01], P = 0.841; Wald test) [Figure 1]. Moreover, 19 (46% [32%; 61%]) complications were reported. EUS-related adverse events occurred in 9 of 41 patients (22% [12%; 37%]) [Table 2] and [Table 3]. Bleeding due to arterial injuries (splenic artery and gastroduodenal artery) during the necessary salvage drainage procedures occurred in all the three drainage failure cases within 25 days following the initial surgery (day 4, day 6, and day 25). After exclusion of the two LAMS drainages, sepsis related to insufficient drainage occurred in one patient after early drainage and in four cases after delayed drainages (25 days post). Four stent migrations were observed, which comprised three intraluminal migrations and one intracystic migration; only two of them needed additional endoscopy. Median followup was 44.75 months (range: 29.24 to 65.74 months). 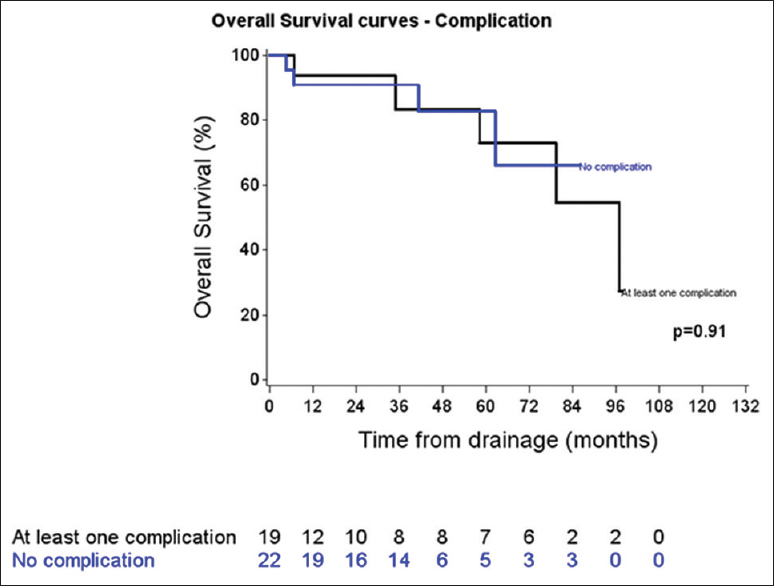 No differences in follow-up and survival were reported between patients with or without complications (P = 0.65; logrank test) [Figure 2] and [Figure 3]. Additionally, no relapses were noted during the follow-up. A summary of the management and follow-up is reported in [Figure 4]. The present study is the largest study on postoperative fluid collection and EUS-guided drainage after pancreatic surgery, even though it has a retrospective design. EUS-guided drainage was efficient for the drainage of this collection, with no relapse over long-term follow-up. There was no control group because the policy of our medicosurgical team is to use EUS-guided drainage as a first-line treatment. This policy allows homogeneous management of these postoperative fluid collections, which was the main interest of this study. In the previously largest study by Tilara et al., 31 patients were included, but only 24 underwent first-line therapy of EUS-guided drainage. Of the 7 remaining patients, 6 underwent previous percutaneous drainage and 1 underwent transpapillary drainage. Moreover, in a study by Varadarajulu et al., of 20 included patients, 10 received additional interventional management that included transpapillary drainage (n = 4), percutaneous drainage (n = 3), or both (n = 3). The number and type of stents inserted into the collection varied in our study. Our experience showed that stent migration was less frequent with double pigtail stents than with straight stents. Additionally, there were fewer re-interventions after placement of two stents than after the placement of only one stent. Therefore, we attempted to place two double pigtail plastic stents in each patient. During the analysis, we considered identifying the insertion of one stent as an incomplete drainage or a partial failure of the drainage technique. However, we chose not to because in cases where it was difficult to insert two stents, we rarely attempted to insert both stents in order to minimize time and avoid insufflation. Further, in our series, LAMS was placed twice with technical success, but it was necessary to replace LAMS with plastic stents in the following days. Necrosectomy, which could be an indication of LAMS placement, was not performed in the management of these collections. Considering these results, the potential risk of arterial bleeding in the management of postoperative fluid collection, as well as a recent paper by Bang et al., placement of LAMS should be excluded from firstline endoscopic treatment of postoperative fluid collection. No transpapillary drainages were performed in our study. We considered the occurrence of pancreatic leakage due to the surgery, but these were without pancreatic duct abnormalities in the remnant pancreatic duct post-surgery. In a multicenter study of 375 patients, non-superiority of transpapillary drainage was described. This study also reported better long-term radiologic resolution without transpapillary drainage. There are multiple concerns regarding transpapillary draining including potential injury from pancreatic duct stenting when the pancreatic duct below the operated lesion is healthy, and/or pancreatic opacification that can induce pancreatitis and may worsen the clinical course. With these concerns in mind, no transpapillary pancreatic stents were placed in our study; however, transpapillary stenting is described in some cases in previous reports., From this point of view, our series is in agreement with the study by Onodera et al., which included 6 patients with EUS-guided drainage. The rate of complications in our study was higher than that in other studies because we reported supplementary endoscopy as a complication according to the current classification of surgical complications; other studies did not use this classification. It is important to consider that symptomatic pancreatic fistula is associated with high morbidity. In a study of 158 patients who developed postoperative complications, 436 CT, 310 interventional imaging, and 26 operative procedures were required. Additionally, there was an average of 38 days of drainage per patient, intensive care unit/hospital re-admission rate was 50%, and mortality rate was 5%. We also know that the etiologies of complications are often difficult to ascertain. As a result, by choosing to consider all complications, our complication rate was more representative of the management of post-pancreatectomy fluid collection. We attempted to adjust the rate of complications with the rate of EUS-related adverse events in order to make comparisons with other studies; however, it was not sufficient, as re-endoscopy was not considered a complication in previous studies. When drainage was within the first month after surgery, bleeding was the most common complication. When drainage occurred later (after the first month post-surgery), sepsis was the dominant complication. This severe bleeding due to arterial injuries (splenic or gastroduodenal arteries) in early drainage was not significant, likely due to the small number of patients. These results were determined because we evaluated all morbidities and re-endoscopy as complications. Four stent migrations were observed; three intraluminal migrations and one intracystic migration. In the latter case, the stent was removed at 2 months with ablation in the same procedure of the stent remained in place after dilation of the fistula track. This migration was considered a complication because ablation was performed at 2 months instead of 3 months. Regarding the intraluminal migrations, two patients were asymptomatic, did not require supplementary endoscopy, and did not present any complications regarding the migration. The last patient presented with sepsis that was likely due to the stent migration; this complication was classified as sepsis. EUS-guided drainage for postoperative fluid collection after pancreatic surgery was an efficient technique with no relapse during long-term follow-up. The substantial rate of morbidity of this technique can be explained by the difficulty in managing patients; however, this had no impact on patient survival. The rate of morbidity was independent of the time between surgery and the drainage procedure; however, it is important to note that bleeding risk is likely more important in cases of early drainage. Tilara A, Gerdes H, Allen P, et al. Endoscopic ultrasound-guided transmural drainage of postoperative pancreatic collections. J Am Coll Surg 2014;218:33-40. Lillemoe KD, Kaushal S, Cameron JL, et al. Distal pancreatectomy: Indications and outcomes in 235 patients. Ann Surg 1999;229:693-8. Balcom JH 4th, Rattner DW, Warshaw AL, et al. Ten-year experience with 733 pancreatic resections: Changing indications, older patients, and decreasing length of hospitalization. Arch Surg 2001;136:391-8. Briggs CD, Mann CD, Irving GR, et al. Systematic review of minimally invasive pancreatic resection. J Gastrointest Surg 2009;13:1129-37. Shimizu S, Tanaka M, Konomi H, et al. Laparoscopic pancreatic surgery: Current indications and surgical results. Surg Endosc 2004;18:402-6. Pannegeon V, Pessaux P, Sauvanet A, et al. Pancreatic fistula after distal pancreatectomy: Predictive risk factors and value of conservative treatment. Arch Surg 2006;141:1071-6. Pedrazzoli S, Liessi G, Pasquali C, et al. Postoperative pancreatic fistulas: Preventing severe complications and reducing reoperation and mortality rate. Ann Surg 2009;249:97-104. Alexakis N, Sutton R, Neoptolemos JP. Surgical treatment of pancreatic fistula. Dig Surg 2004;21:262-74. Kuroki T, Tajima Y, Kanematsu T. Surgical management for the prevention of pancreatic fistula following distal pancreatectomy. J Hepatobiliary Pancreat Surg 2005;12:283-5. Roggin KK, Rudloff U, Blumgart LH, et al. Central pancreatectomy revisited. J Gastrointest Surg 2006;10:804-12. Harnoss JC, Ulrich AB, Harnoss JM, et al. Use and results of consensus definitions in pancreatic surgery: A systematic review. Surgery 2014;155:47-57. Goudard Y, Gaujoux S, Dokmak S, et al. Reappraisal of central pancreatectomy a 12-year single-center experience. 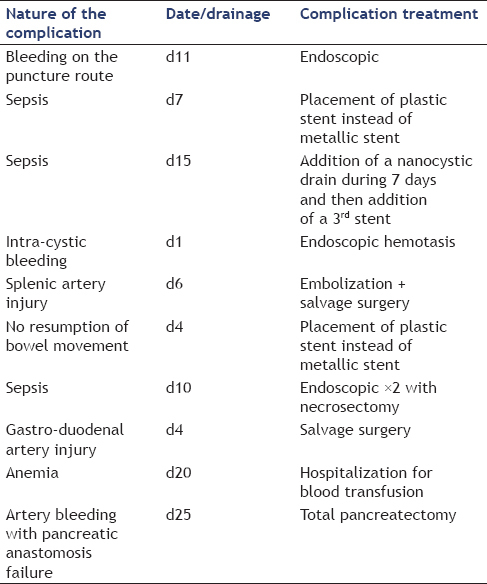 JAMA Surg 2014;149:356-63. Vin Y, Sima CS, Getrajdman GI, et al. 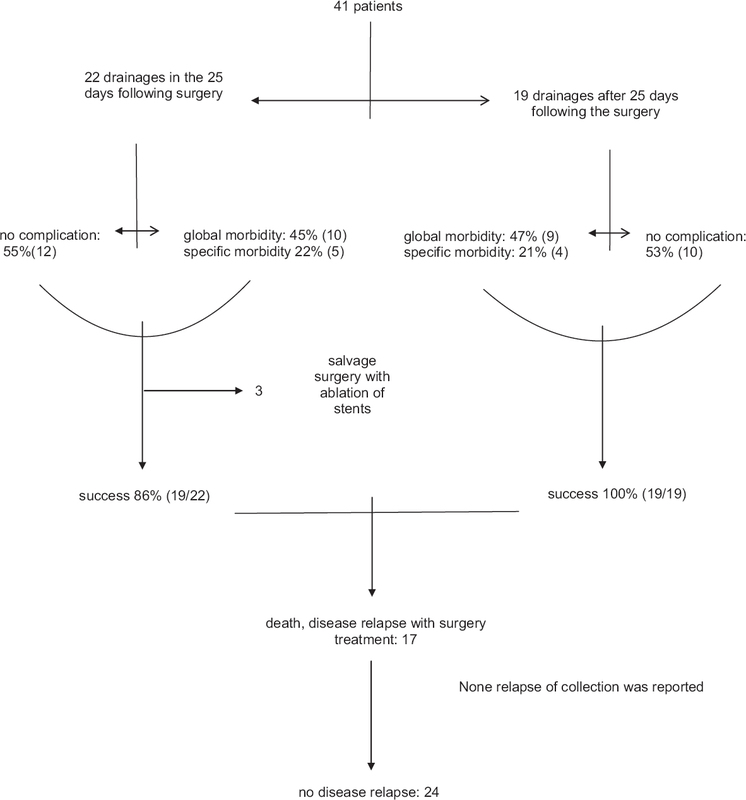 Management and outcomes of postpancreatectomy fistula, leak, and abscess: Results of 908 patients resected at a single institution between 2000 and 2005. J Am Coll Surg 2008;207:490-8. Goh BK, Tan YM, Chung YF, et al. Critical appraisal of 232 consecutive distal pancreatectomies with emphasis on risk factors, outcome, and management of the postoperative pancreatic fistula: A 21-year experience at a single institution. Arch Surg 2008;143:956-65. Bassi C, Dervenis C, Butturini G, et al. Postoperative pancreatic fistula: An international study group (ISGPF) definition. Surgery 2005;138:8-13. Onodera M, Kawakami H, Kuwatani M, et al. Endoscopic ultrasound-guided transmural drainage for pancreatic fistula or pancreatic duct dilation after pancreatic surgery. Surg Endosc 2012;26:1710-7. Varadarajulu S, Wilcox CM, Christein JD. EUS-guided therapy for management of peripancreatic fluid collections after distal pancreatectomy in 20 consecutive patients. Gastrointest Endosc 2011;74:418-23. Denzer UW, Sioulas AD, Abdulkarim M, et al. Endoscopic ultrasound-guided drainage of abdominal fluid collections after pancreatic surgery: Efficacy and long-term follow-up. Z Gastroenterol 2016;54:1047-53. Cavallini A, Butturini G, Malleo G, et al. Endoscopic transmural drainage of pseudocysts associated with pancreatic resections or pancreatitis: A comparative study. Surg Endosc 2011;25:1518-25. Gupta T, Lemmers A, Tan D, et al. EUS-guided transmural drainage of postoperative collections. Gastrointest Endosc 2012;76:1259-65. Kwon YM, Gerdes H, Schattner MA, et al. Management of peripancreatic fluid collections following partial pancreatectomy: A comparison of percutaneous versus EUS-guided drainage. Surg Endosc 2013;27:2422-7. Téllez-Ávila F, Carmona-Aguilera GJ, Valdovinos-Andraca F, et al. Postoperative abdominal collections drainage: Percutaneous versus guided by endoscopic ultrasound. Dig Endosc 2015;27:762-6. Fotoohi M, D'Agostino HB, Wollman B, et al. Persistent pancreatocutaneous fistula after percutaneous drainage of pancreatic fluid collections: Role of cause and severity of pancreatitis. Radiology 1999;213:573-8. Azeem N, Baron TH, Topazian MD, et al. Outcomes of endoscopic and percutaneous drainage of pancreatic fluid collections arising after pancreatic tail resection. J Am Coll Surg 2012;215:177-85. Costamagna G, Mutignani M, Ingrosso M, et al. Endoscopic treatment of postsurgical external pancreatic fistulas. Endoscopy 2001;33:317-22. Arvanitakis M, Delhaye M, Bali MA, et al. Endoscopic treatment of external pancreatic fistulas: When draining the main pancreatic duct is not enough. Am J Gastroenterol 2007;102:516-24. Seewald S, Ang TL, Teng KC, et al. EUS-guided drainage of pancreatic pseudocysts, abscesses and infected necrosis. Dig Endosc 2009;21 Suppl 1:S61-5. Varadarajulu S, Bang JY, Phadnis MA, et al. Endoscopic transmural drainage of peripancreatic fluid collections: Outcomes and predictors of treatment success in 211 consecutive patients. J Gastrointest Surg 2011;15:2080-8. Lopes CV, Pesenti C, Bories E, et al. Endoscopic-ultrasound-guided endoscopic transmural drainage of pancreatic pseudocysts and abscesses. Scand J Gastroenterol 2007;42:524-9. Bang JY, Hasan M, Navaneethan U, et al. Lumen-apposing metal stents (LAMS) for pancreatic fluid collection (PFC) drainage: May not be business as usual. Gut 2017;66:2054-6. Yang D, Amin S, Gonzalez S, et al. Transpapillary drainage has no added benefit on treatment outcomes in patients undergoing EUS-guided transmural drainage of pancreatic pseudocysts: A large multicenter study. Gastrointest Endosc 2016;83:720-9. Grobmyer SR, Hunt DL, Forsmark CE, et al. Pancreatic stent placement is associated with resolution of refractory grade C pancreatic fistula after left-sided pancreatectomy. Am Surg 2009;75:654-7. Clavien PA, Barkun J, de Oliveira ML, et al. The Clavien-Dindo classification of surgical complications: Five-year experience. Ann Surg 2009;250:187-96.